The hardest part of going gluten free for me was the pasta. It runs a very close second to potatoes in the “must have” category. I cannot describe how MUCH I love pasta. Come to think of it, I don’t think I’ve ever met anyone that didn’t love it! Tonight was one of those “must have pasta” nights. It’s been a long week (all 3 days of it) and I needed my favorite comfort food. Spaghetti squash has become my new best friend when pasta is needed. This turned out to be very good, filling, and easy to prepare. 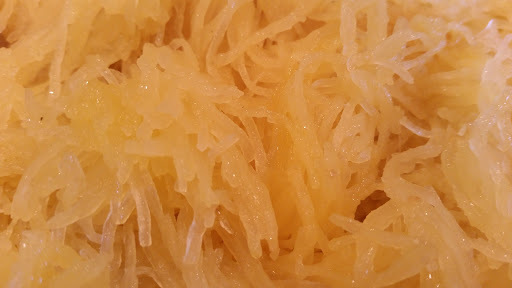 To prepare the spaghetti squash, cut the squash in half top to bottom. Drizzle with olive oil and sprinkle with salt and pepper. Place cut side down on a baking sheet and roast at 400 degrees for approximately 40 minutes until the squash is tender. In a large saute pan, fry the bacon until crisp. Add the mushrooms and cook for about a minute. Add the vinegar and syrup and stir to mix well. Begin adding the spinach a handful at a time allowing the spinach to wilt slightly before adding more. When all the spinach has been added and wilted, turn off the heat and set to the side. Prepare the squash by removing the seeds in the center and discarding. With a fork, scrape the squash forming spaghetti like noodles. Place these in a large bowl. 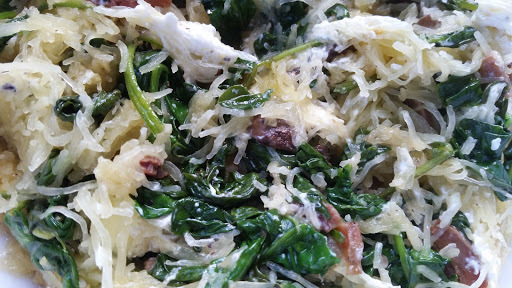 To the spaghetti squash, add the spinach mixture and combine well. Check for salt and pepper, then add the goat cheese and toss. This will definitely be on the menu rotation.